New York City taxi drivers are issuing a cry for help after one of their own went missing amid increasing pressures on their livelihoods. John Chandler reports. New York City's yellow taxi drivers were once fiercely competitive with each other, but these days, they have Uber, Lyft and other competition to worry about — competition, they say, that has pushed many cabbies to the brink of financial ruin, with their expensive medallions now hardly worth anything. Some fear that desperation is the reason one of their fellow drivers is missing. 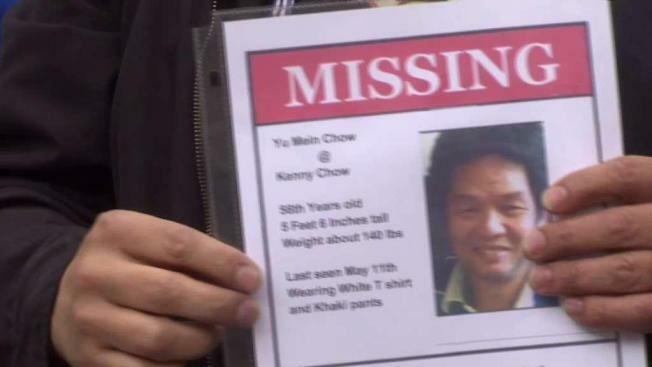 Kenny Chow has been gone 11 days as of Tuesday, and his brother Richard Chow has been posting fliers near where Kenny's abandoned taxi was found, near the corner of 86th Street and East End Avenue. "I was looking around the park. He never showed," said Richard Chow. "I'm very, very worried about my brother." Richard said his brother owed $700,000 on the loan for his medallion, working 14-hour shifts without a partner. The missing man's wife was also recently diagnosed with stage four colon cancer. The New York Taxi Workers Alliance organized a rally on the Upper East Side in the wake of Kenny Chow's disappearance, and the anger of the roughly two dozen drivers was palpable. Asked to raise a hand if they were in financial trouble, everyone's hands went up. Then, fear and frustration spilled out. "No one really seems to give a damn," one driver said. "I invest in this city." Nicolae Hent, who immigrated from Romania in 1988, angrily disparaged Uber, Lyft and Juno — the ride share companies are only loosely regulated in New York City, compared to yellow taxi drivers — saying, "I may speak with an accent, but I'm not stupid." Hent's best friend was one of four cab drivers to recently die by suicide. He believes app-based services like Uber are driving taxi drivers into desperation. Taxi medallions were worth over $1 million in 2014; now, they sell for as little as $175,000, according to The New York Times. Once a guaranteed livelihood and retirement fund, especially for new immigrants, the value of the medallion has nosedived amid the rise in ride-sharing apps. Kenny Chow himself purchased a medallion in 2010, after turning to driving as a profession in 2008, according to the New York Taxi Workers Alliance. He'd been a jeweler for 20 years before that, but had to change professions when his employer closed shop. The "devoted" father and husband worked hard to rebuild his life with the hope of having stable work "but instability of the past five years caused him increasing anxiety," Hent said. Hent said "nothing's being done to help," adding that he believes it's because of "pressure from up above." He points to Mayor Bill de Blasio's failed 2015 proposal to cap new permits, something that current City Council Speaker Corey Johnson conceded on WNYC Radio was a mistake not to support. "I’ll give myself some demerits for not understanding the depth of this and grasping the issues that we would come to face over three years ago. I was skeptical at the time. I didn’t sign on as a sponsor of that bill," Johnson said. He now tells News 4 the Council is looking at several bills to regulate the for-hire industry. "The City Council understands that the taxi industry is going through a seismic shift right now, one that has caused a lot of pain for drivers who are worried about their livelihoods," he said in a statement. "The Council is looking at several bills to regulate the for-hire vehicle industry, both to protect drivers and to cut down on congestion, as they go through the legislative process." But that might be too late for a driver like Janna Stroe. The 60-year-old still owes $500,000 on her medallion. "I have to live another life to pay this loan," she said, adding that losing her husband to cancer piled onto her debt. The New York Taxi Workers Alliance says bills to regulate ride-sharing app companies notwithstanding, the group's main economic concerns remain unaddressed — like regulating one minimum fare rate across the industry so that no one company can go lower. A spokesman for Mayor de Blasio recently told The New York Times that new regulations on for-hire vehicles were being discussed again: "The mayor has been clear about the need to re-evaluate our options in the face of explosive growth we're seeing in the industry," spokesman Austin Finan said.